This chapel opened in 1858 to provide services in English. Previously the only Nonconformist services available in Risca were largely or entirely conducted in Welsh. The coal and metal industries were drawing in many settlers from outside Wales. Bethany was home to the English Baptist Church, which had held its first services on 21 October 1855 at the British Schoolroom. 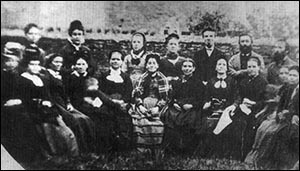 Before then, it had held meetings in various buildings, including Moriah Chapel (Risca’s predominantly Welsh-language Baptist chapel). 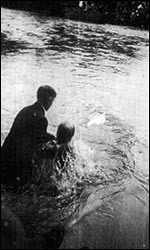 River baptisms, as depicted in the old photo, were occasionally performed long after Bethany chapel opened. The building was enlarged in 1876 and again in 1893, when membership exceeded 380 and the Sunday School was attracting about 600 children. It took until 1917 to clear the £3,000 debt for the 1893 enlargement, which included a new schoolroom. The chapel catered for members’ social as well as spiritual needs. An early photo (left) shows the Bethany sewing class in 1880 – including three men! In the 20th century, Bethany had its own cricket team, choir and jazz band, and the chapel organised outings to places such as Barry Island. Every Whitsun there was a Witness Walk through the streets of Risca which ended with tea at Bethany and sports in the nearby Stores Field. The procession was led by a local brass band and at its height attracted 1,000 walkers. Growth in road traffic put paid to the tradition in the 1960s. Plaques inside the chapel list 33 members who died in the First World War and three who died in the Second World War.